Do the names Elias Howe or Isaac Singer mean anything to you? If you’ve ever taken a Home Ec course (or even worn clothing, for that matter) they should — those two gentlemen are credited with the invention of the modern sewing machine. While the wheel, telephone, and personal computer get a lot of the glory for changing how humans live, the sewing machine is somewhat of an unsung hero. Without it, however, we’d still be squinting to thread needles and stitching together our shirts and suits by hand. Whether you want a simple set of curtains to block out the bright sun and the neighbors’ prying eyes, or you just aren’t satisfied by shopping off the rack, sewing machines are handy appliances that deserve accolades. 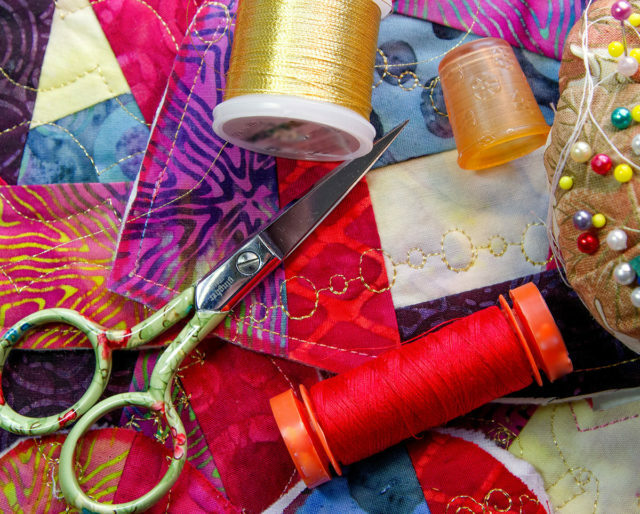 Dream up some custom couture and celebrate National Sewing Machine Day this June 13. There are people who don’t have enough clothes to wear, shelter animals who need warm snuggly blankets for their crates, and children who would love a handmade stuffed animal to cuddle at night. So why not put your skills to good use and sew something that will be truly appreciated? One of the best parts of practicing a hobby like sewing is the camaraderie that can result. If your sewing machine is portable, head to a local fabric store or a friend’s house and stitch with others. Or you can swap ideas, solicit solutions, and show off your handiwork on one of the many websites or forums dedicated to crafting. Craftsy.com is one of the better known, but you’ll also find fellow sewists on Facebook, Twitter and all over the web. Give your sewing machine an evening off and tune in to the Great British Sewing Bee, a spinoff of the wildly popular Great British Bake-Off, which aired between 2013 - 2016. Featuring a pattern challenge, an alteration challenge, and a made-to-measure challenge, the reality program is sure to stoke your creativity. Like a smidgen more snark in your shows? There’s also Project Runway, which has been strutting its stuff on the airwaves for over a decade now! That’s a lot of chances to “make it work,” in the words of star Tim Gunn. Have you been in a fabric store lately? It’s not just calico and tacky old polyester anymore. Want a pair of fleece pajamas printed with playful cartoon otters? Draperies with alternating panels of chartreuse lamé and crushed cherry velvet? If you have a sewing machine, you can create just about any kind of clothing or home decor. Maybe you remember your mother sewing clothes, or your grandmother. Even if not, someone in your history likely spent a lot of time sitting at a sewing machine. It can be easy to forget, in this day of $10 t-shirts, that there was a time when providing clothing for the family was a labor-intensive endeavor — one that was made much easier with the advent of sewing machine. Much like other domestic activities that are undergoing a renaissance recently — knitting, scratch baking, homebrewing — sewing not only is an enjoyable hobby, but one that yields gratifying results. While it may require a bit of a learning curve if you don’t yet know how to sew, the end product will be practical, beautiful, or both. You can’t say that about mastering the next level of Call of Duty: Infinite Warfare.